In 2001, my partner Lena and I were faced with the prospect of living in a dark and dingy 1930’s duplex “one of a pair” solid brick dwelling built in 1930, renovating it, or buying another house. The old house had a maze of small pokey rooms. We viewed the high cost of selling and buying property, where a lot of money goes to the “middlemen and the taxman”, as a waste of money. We were really keen to make maximum use of the sun for heating and natural lighting, and decided to go ahead with renovating. We prepared a detailed brief covering our requirements, with a strong focus on low environmental impact features. After discussing the project with Andreas and Judy Sederof from Sunpower Design, we felt confident that we could achieve what we wanted, although the site and the existing dwelling presented challenges. It soon became clear to us that the expertise and ideas that experienced “sustainable and solar efficient” architects provide is invaluable. After the renovation every room was changed. The front living room became the master bedroom with an ensuite and walk-in-robe attached. The rear of the building was removed. The streetscape and the connection to the neighbouring duplex were maintained. 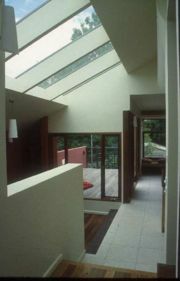 The design incorporates the use of courtyards and glazing on the north face to maximize solar gain. Extensive double glazed roof glazing over the dining/living area also brings light in from the north, which compensates for the lack of windows on the northern party wall. In summer, all the north-facing glazing can be shaded my sails and blinds. This is essential to prevent the house getting too hot when the sun is strong. The extension was built with a suspended concrete slab for thermal mass. The party wall was built from aerated autoclaved concrete (AAC) blockwork, which is light to handle, easily shaped, has good thermal mass and insulates well. There is a basement below the living room has to accommodate batteries, storage, a dog shower and a cellar. Maximum cross flow ventilation has been achieved with carefully positioned windows. A window positioned above the stairs creates a thermal chimney/venturi effect when it is open; warm air from the entire house can be vented through this in the evening in a matter of minutes. The open plan nature of the kitchen, dining and living spaces opening onto an external north-facing deck and internal courtyard are very conducive to a relaxed lifestyle. A shade sail also protects the deck in summer, and is removed in winter to allow maximum solar penetration into the building. We have a large double study above the living areas with views across the leafy valley of Back Creek. The pitch of the North-facing roof was designed to accommodate twenty solar panels and a solar hot water service. The design conformed to building and planning regulations, so a planning permit was not required. 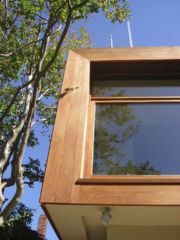 Passive solar design is provided by regulation of sunlight from North facing windows (via selective shading using blinds or sails) onto thermal mass such as masonry walls and the concrete slab. This damps down temperature variations inside the house. In the Winter, sun is allowed onto the walls and floor slab to warm it up during the day. It then releases some of this stored warmth during the night. In the Summer, sail and blinds are used to shade the north facing windows. However, make sure you use a sail fabric that excludes maximum heat. A solar chimney is created by a venturi peak with a window above the roofline overhead the upstairs stairwell. Hot air rises and leaves the house when this window is open. Cross-flow ventilation is achieved by the placement of wide-opening windows all around the house. When opened in the evening, these also allow cool air to be quickly drawn into the house when warm air is venting up and exhausted through the solar chimney. The two additional ducts in the new family room at the rear were not sufficient to heat the rear room well. Twenty 75-watt solar panels (BP Solar Modules, BP275). Carbon emissions are calculated based on 1.24kg C02 per kW-h of electricity generated using brown coal. 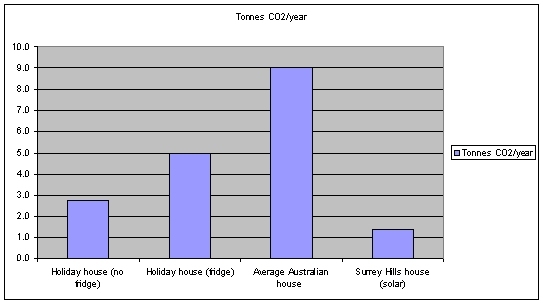 The following table compares energy usage and carbon emissions of the Surrey Hills house with categories of Australian houses. energy efficiency measures such as low power appliances and lighting. saved 3.25 tonnes of CO2 emissions per year compared to a normal Australian home. saved at total of over 13 tonnes of CO2 over a four year period from 2002 to 2007 compared to a normal Australian home. Water is provided by rainwater tanks (2 x 4500 and 13,500 litre) giving us a total of 22,500 litres of storage for rainwater collected from our roof. First flush diverters remove impurities in the water that first comes off the roof when it starts raining. 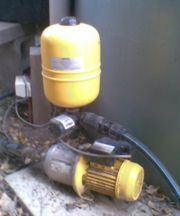 A Davey electric pump supplies rainwater for all uses in the house. Tip: Go for a more powerful pump rather than one that just meets your requirements. Grey water collected from showers and the bath can be diverted onto the rear garden. Don’t collect washing machine water if you are washing nappies! All appliances have 4.5 star energy rating or better. All are manufactured in Europe. We don’t use a filter system and have had acceptable results from water quality tests conducted on our tankwater. The Davey electric pump supplies the tankwater for all uses in the house including showers, the dishwasher, the laundry, the hot water system and garden watering. We have additional tap for Melbourne water in the kitchen sink for some drinking and cooking uses. There is another Melbourne water tap under the house that can be used to fill the rainwater tanks should they run out of water. 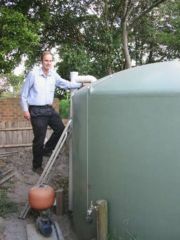 We filled the rainwater tanks in late 2001 when we moved in after the house renovation. We have only needed to add more Melbourne water on one occasion early in 2002 and on two occasions early in 2007 during the severe drought. This means we have been basically self sufficient for water for around 5 years, which equates to a saving of around 0.3 megalitres of water per year and 1.5 megalitres over five years, based on Melbourne Water’s estimated daily average water usage of 303 litres per person (as of December 2007 with Stage 3A restrictions in place). This water would otherwise be lost as stormwater. With stage 3A water restrictions now in place, watering is becoming more difficult. I am in the process of installing a garden watering system. The original plan was to put in 5 zones with drip/bubbler tubes. However, efficient drip systems need to have a lot of drip tube to provide the water flow required for solenoid switches to operate. Less zones for drip: I am in the process of reducing the five zones orignally planned to one zone of interconnected drip lines which only required a single solenoid. Use 19mm connector lines: The drip lines are best connected with 19mm lines rather than the 13mm line I was intending to use. This increases the efficiency of getting water to the drip lines. Grid patterns for drip lines: The drip lines need to be all interconnected in grid patterns and between the grids. Controllers must allow watering on specific days of the week: Stage 3A restrictions only allow automatic dripper systems for watering from midnight to 2.00am to 12 on specific days of the week. Even-numbered properties can water on Saturday and Tuesday; odd numbered can water on Sunday and Wednesday. We are amazed by how effective the passive solar design is. On a sunny winter day, the rear of the house is so warm that we don’t need the heater on. In summer with all sails and blinds in place, the house stays cool. The double-glazing has been a great success in both regulating the temperature and keeping noise out. We use no soft furnishings over the double glazed windows as they restrict solar access if left closed during the day. 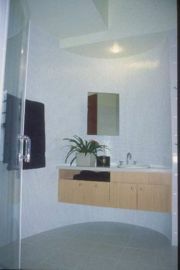 Curtains are used on rooms where privacy is required. If you are planning to build or renovate, and you want to avoid native forest timbers (as we did) you need to carefully research suitable timber and find tradespeople who are prepared to use it. Western Red cedar comes from old growth forests in North America, and some people are allergic to it. See Forest friendly timber article for more information. Our resident brush-tailed possum approved of the polyester insulation. He fled the original garage roof when I demolished it, but he found his way back in with great persistence. I eventually blocked out his entrance point (from next door's eaves) and put a possum box up in the large tree on the nature strip. He/she now transits our roof on the outside every night to get to the backyard trees for a feed. The tanks have provided 99% of our water usage since we have been living in the house over six years. We added some Melbourne water to the tanks with Melbourne water during the drought in 2001, then twice again in January and March 2007. We have been on a steep learning curve with grey water. The initial system using a tank and pump was not successful as the greywater quickly became foul. We have converted the tank over to rainwater for the garden are setting up a divert grey water diversion onto the garden. While you can now buy specially designed grey water systems, they are very expensive and will require maintenance. Rainwater is suitable for all uses, so I think it is better to install the best rainwater system with the biggest tanks (and electric pump if you need one) you can fit and/or afford. We have designed and planted the front garden with natives and other plants with low water requirements. In the back yard, we are planting food-producing species in a permaculture system, including fruit trees, a herb garden and a vegetable garden. In summary, we decided to commit to this project to take personal and significant action to lower our environmental and lifestyle footprint and we are both very happy with the outcome. We found that the study upstairs got too hot for comfort during very hot Melbourne days. This is partly due to our sails only screening out about 50% of the sunlight entering the windows. When purchasing sails, make sure you get fabric which excludes over 95% of incident sunlight. We fitted Renshade perforated aluminium foil screens inside the upstairs windows. The foil screen is simply cut to size using scissors then fixed with Velcro buttons. The manufacturer claims that the screens stop approximately 85% of all inward high temperature radiation. We agree; they have dramatically reduced the temperature upstairs. The batteries on our system require large amounts of distilled water. I added nearly 40 litres of distilled water in mid March 2007. The last time they were topped up was 16 June 2007. The inverter charges the batteries, and in doing so some of the water in the batteries is converted to hydrogen and oxygen, which is off gassed. Faulty or tired batteries could be sapping the power you produce. Lorraine Hughes of the Knoxfield house has determined that a faulty battery in her system was causing the inverter to excessively charge the battery bank, meaning that less electricity was exported to the grid. By early 2011, the original wet cell batteries installed were requiring very frequent water top ups, up to 2 litres per cell every 4 months. 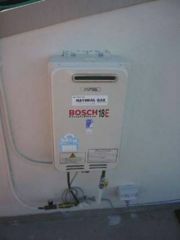 The inverter was spending a lot of time and power attempting to boost charge them, which of was wasting of energy. After about 10 years of service, they needed replacement. The inverter voltage setting was adjusted for these cells. They provide backup power for the house if the grid fails. They are not routinely used for power. The gas central heating system does not warm up the family room well, and it uses a lot of gas, which results in carbon emissions. For the winter of 2011, we installed two high efficiency heat pumps mainly for heating purposes. Both these units can be used for cooling during the summer, but it likely that we will use only the upstairs unit infrequently for this. More information: Surrey_Hills_house#Heating. The house has a low water garden in the front and the Sanci permaculture garden for producing food and shade in the rear. In April 2012, this Surrey Hills house won the Sustainable Homes Gold Awards from the City of Boroondara and the garden got a Special Commendation. This page was last modified 07:07, 26 April 2012. This page has been accessed 363,453 times.